Main menu functions: all of chart’s settings, allowing you to reach maximum customization for your trading style. Special features: some additional user-friendly features and shortcuts, that allow you a better control and expanded abilities. Typical feature, that allows you easily find your favorite asset. When there is more than one chart available: a multiscreen feature – a new asset will be uploaded into active chart. Another well-known function, allows you to change a period of time presented by each candle. Choose any timeframe, from 1 tick to 1 week. Allows you to choose among 4 most popular chart’s types: bars, candles, line and area. We are planning to add Renko and Kagi chart types in closest time. Three different color combinations allowed, the traditional green/red, retro black/white and modern blue-light/purple, each combination might be in light or dark style. Instantly growing set of indicators is available for better analyzing with commonly used settings and color choice options. After drawing one, click on its data box or line to edit/remove it. To make your analysis more precise, use drawing tools: from line and channel to Fibonacci levels and Gann Fan. Click on drawing’s line to edit/delete it. Set your trading ideas with “trade” tool. Allows you to open up to 6 charts simultaneously in different layouts for tracking different assets/timeframes. See more features capabilities of “multiscreen” in “Special Features”. Finished your analysis and want to share it with your friends/trading community? A one click option allows you to save screen as a link or/and share it with your friends or trading community. When you activated a multiscreen feature and want to enlarge any chart to full screen mode, it can be done easily without breaking your setup: just doubleclick everywhere on the chart you want to make bigger – and it will expand. Another doubleclick will return it to original size. Staying in multiscreen mode – in case you wish to rearrange the order of charts in your layout, just grab the chart you want to replace by its OHLC data box and drag and drop it in other place: two charts will switch their places. Still staying in multiscreen mode – if you are in need to add any indicator, that is already set on some other chart, just catch it by its data box on first chart and then drag-and-drop to second chart, exactly where you need to use it. 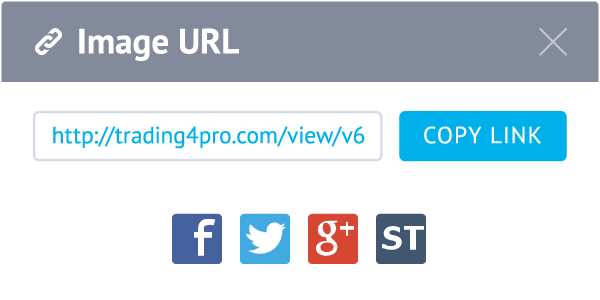 After sharing your trading ideas with friends/community using screenshot feature – it will appear in trading4pro.com/view/L6NtBysC type of link. After “replay” icon is clicked on your idea’s image, a person will be redirected to chart and then your idea will be reloaded to that chart exactly as you published it. Clicking “replay” icon on chart will upload new candles, allowing to test the preciseness of your analysis.